Milwood Neighborhood Assoc. | A community-driven neighborhood in North Austin, Texas 78727. MNA dedicates its time to improve Milwood. 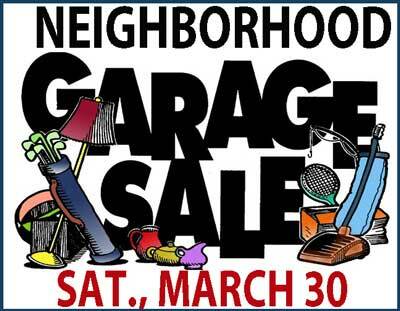 Milwood’s Garage Sale – Sat. March 30: 20+ Houses! Don’t Miss Milwood’s Garage Sale on Saturday, March 30th, 2019! Mark your calendars so you can find some wonderful treasurers at the best prices from your neighbors! 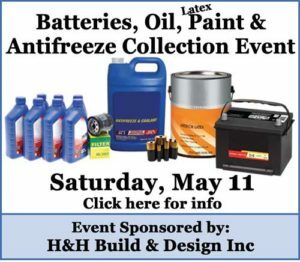 Sign-up your garage sale HERE. It is easy and free to MNA Members (which is $15 annual dues, join any time online). Pay $15 online anytime here to be listed. It’s quick and secure. The list and map were deleted after the event. We have an update on the Adelphi Lane Sidewalk from Amherst to Scribe Dr & Balcones Youth Sports Ballfields: Project Link Here. After some communication back and forth, we have been assured by the city that they will be including sidewalk on the South/neighborhood side all the way from Adelphi Acre Community Garden to Scribe Drive, not just to Amalfi Cove. It will be 5ft wide. 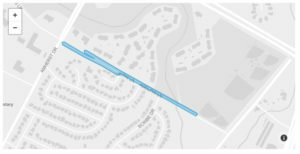 Sidewalk will also be added on the connecting streets of Amalfi Cove, Gable and Scribe to complete the gaps there and make sure they completely connect to the new sidewalk on Adelphi Lane. Also the project will be connecting the existing sidewalk on the North/Apt Side of Adelphi and making it 8ft wide. It will go from the current sidewalk all the way down to the ballfields. It’s intention is a Shared Use Path. The field engineer and team are out there starting today, Nov. 8, 2018 to get the project started. The timeline will be about 4-6 months. As a heads up: At some point, the road will be harder to access to due to construction and flaggers will direct traffic as needed. We are so excited to see this done! Compost Your Pumpkin & Save Your Trash Bin! Simply remove all non-compostable items, like metal, plastic, jewels. Paint and Wax are OK! Then place them in the green compost bin near garage or front yard. 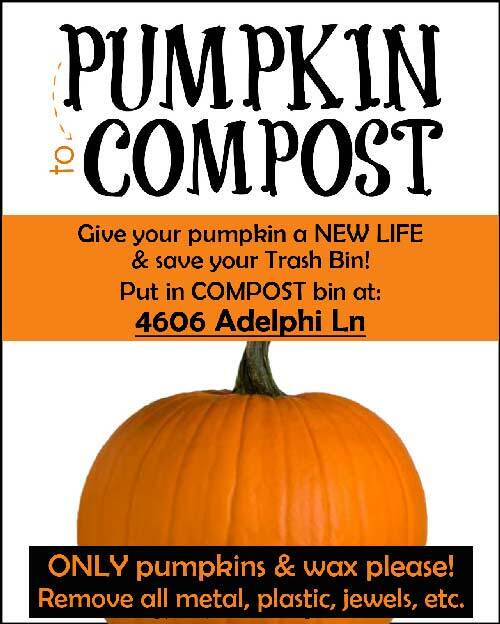 Also Adelphi Acre Community Garden is also happy to take your pumpkins at their back gate entrance too. They also need browns – LEAVES – so if anyone has any bagged up they would really appreciate them! Mobility & Safe Routes to School INPUT needed ASAP! We need your feedback & ideas to help capture some bond dollars for our area!!! We have the chance to fight for some of the 2016 Mobility Bond dollars that are currently unspoken for BUT in order to do so we need to gather data and valuable input from you now! We will then compile it and build our case in hopes that some of those dollars can be matched with improvements in our area. Specifically there is $27.5 million dollars in the bond that is to be used for Safe Routes to Schools. SO if you currently or will one day have a child going to Summitt Elementary (or be bused to Murchison or Anderson) then PLEASE take 15 minutes to complete this SCHOOL ROUTES SURVEY here. If you have additional ideas to share that do NOT fit in the Safe Routes to School area, please add them on the Other Improvement Survey or Map. We can’t make our case without your input! An example of a project that will hopefully happen with these bond dollars is the addition of missing sidewalk on Adelphi Lane, east of Amherst to Scribe. Project details here. Please note: We are in the process of working with the city to get this sidewalk moved to the south side of the street rather than where it is currently outlined for the north side. Thoughts? Email us at mnaboard(a)milwoodna.com with feedback. Complete the Safe Routes to SCHOOL Survey NOW! Complete the Other Improvement Survey NOW! RSVP to the Mobility & Transportation Meeting: NEXT Wednesday, Oct 24th at 7:30pm at Milwood Baptist Church to discuss this topic further. Please, Please complete the survey above!